On October 9 in San Francisco, Planet Granite has pledged to match up to $20,000 of raised funds for the American Safe Climbing Association! This week there is also a HUGE online outdoor gear auction and in the process we are writing a guide for other non-profits to raise money through online auctions. Even if you can not make the event, you can help by making a donation at this link before October 15 and Planet Granite will match it. If you are planning to make a donation this year, please do it before 10.15. 3 - Just make a donation before October 15 and get it matched! 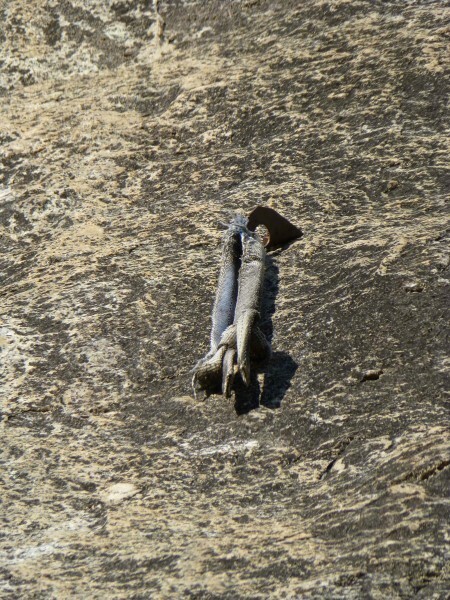 The ASCA is a bare bones non profit organization of dedicated climbers who replace unsafe anchors and reduce the visual and environmental impacts of climbing. Over the years, they have placed over 8,500 bolts and this year is no different! 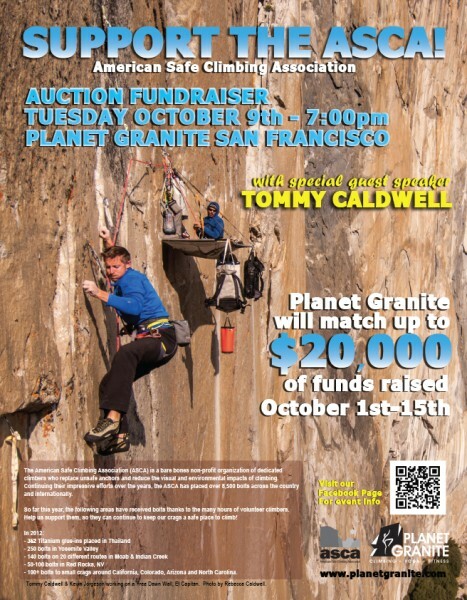 On October 9th, at Planet Granite San Francisco, join us for a night of FUN, with a live auction of amazing items! Plus, Tommy Caldwell will be our guest of honor! 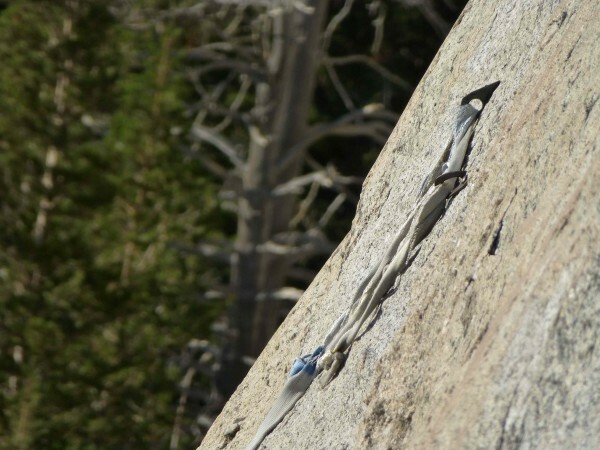 Chris McNamara will introduce and share some mostly Tommy related climbing stories. RSVP at the Facebook Event Page and check back often, as we'll be posting items that will be raffled off! Remember, for every $10 you donate, PG will match it and it will be come $20! Let's help raise money for the ASCA!! Please email me (Chris McNamara) if you have anything to donate for the auction (basically anything worth more than $50). Please me (Chris McNamara) if you have anything to donate for the auction. What does this mean Chris? I look forward to the event! So far only 60 RSVP's. last year there were 300+ folks... show some love for Tommy! Anchor of Playing With A Full Deck, Medlicott Dome, Tuolumne - 9/7/12. 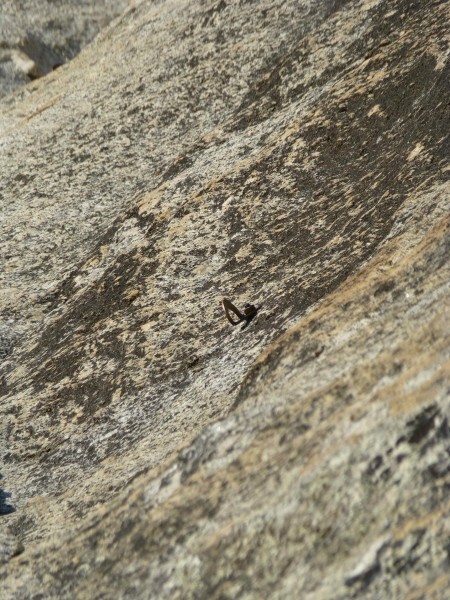 First pro bolt on Hyperspace, Medlicott Dome, Tuolumne - 9/7/12. 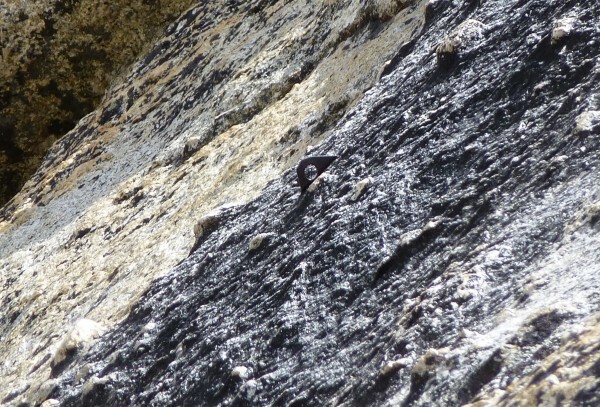 The (only) pro bolt, pitch 1 of Blacklight, West Farthing wall, Tuolumne - 9/6/12. Second pro bolt, Hyperspace, Medlicott dome - 9/7/12. Just got a set of brand new Alien cams from Fixe for the auction! I am hoping to get some more BIG TICKET items for the auction. Any ideas on what types of things raise the most money at these types of events? Signed topo's with personal notes next to your (CMac's) favorite routes? Bump for a great cause. See you all there! Saturday bump-i-dee-do for everyone heading back from a day outside. Chris, is there a way to get notified of the online auction when it starts. I will try to watch this thread but might miss it in my personal busyness. Just got some sweet gear from Metolius including the OutdoorGearLab best wall harness, the Metolius Waldo. Also got some training holds and a trad harness. Eric, ill be posting all about the event when the auction starts... i think it will start tuesday and go for 10 days. If you follow ASCA or SuperTopo on Twitter or Facebook, you will get the updates.